The global go-to for transporting good has (since 1956) been the humble yet highly efficient shipping container. However, these behemoth metal monsters of the freight world are often decommissioned due to the high cost involved in hauling them back to their place of origin. Because of this, of the approximately 30 million steel containers that exist, a huge number are futilely dormant and empty in ports around the world. Thankfully, architects, designers and inventors are constantly seeking to give these metal giants a new, sustainable and useful life. Shipping container dwellings, offices and other miscellaneous structures offer a low cost, efficient and flexible alternative to traditional buildings. 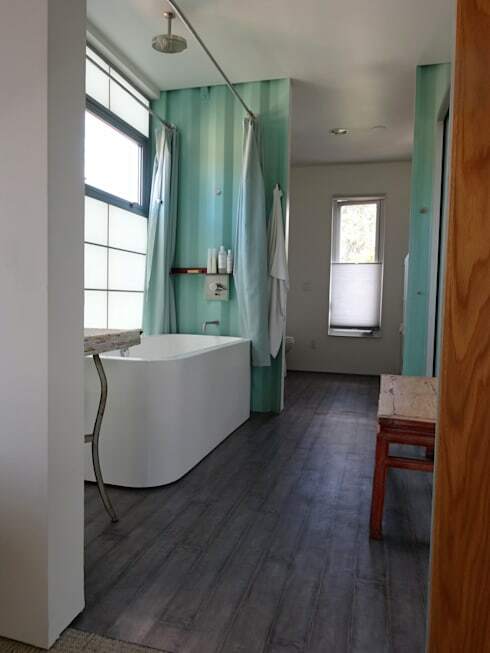 They bring an environmental friendliness to the construction industry, offering challenging yet remarkable options previously unavailable to the standard homebuilder. Today we are taking a rare peek inside one of the more impressive container homes. Designed by Antony Brown, founder of Ecosa Institute, this dwelling is the apotheosis of Brown's mission and philosophy. Located in Flagstaff, Arizona, the house works in symbioses with the surrounding landscape, offering an eco-friendly, green, and fully sustainable residence. 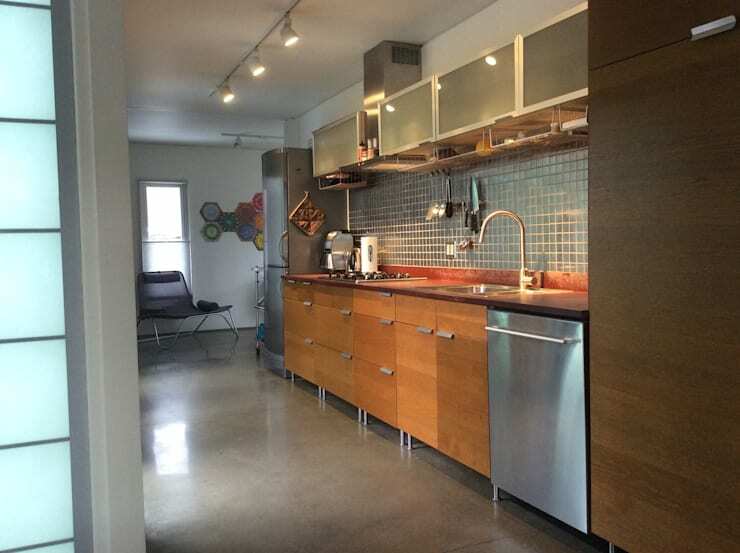 If you would like to check out this abode's interior, read on below for more information! 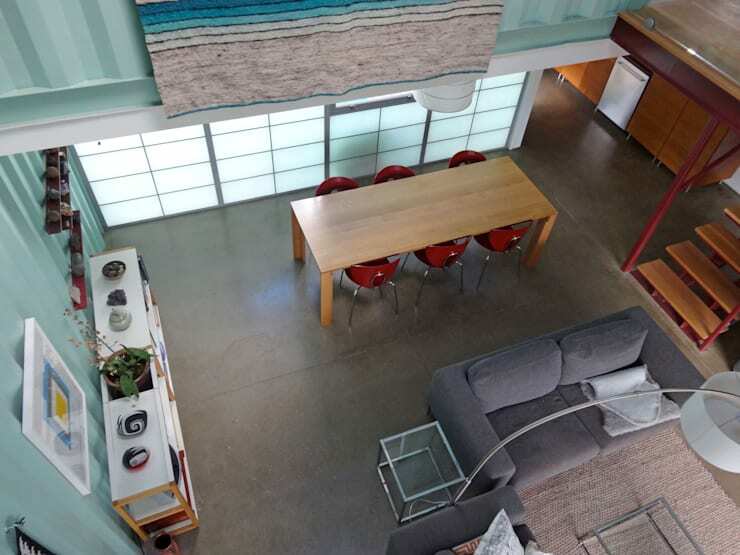 Constructed using repurposed shipping containers, this unique dwelling was the first such home in the area. It was included as part of the Coconino County Sustainable Building Program and completed in 2010. We immediately notice the bold mint green exterior, and are impressed by its ability to create a welcoming yet original aesthetic. From this perspective we are able to see the solar panelling that has been affixed to the roof. This provides enough energy to part-power the house, and makes use of the bright Arizona sun. 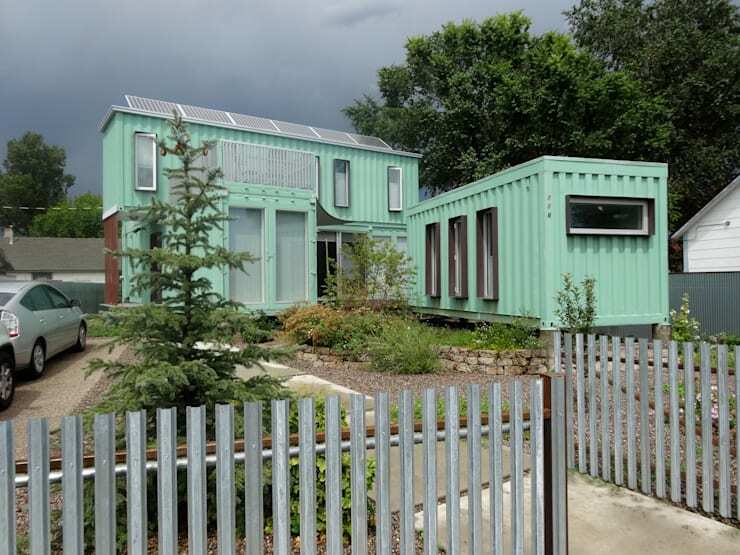 Additionally, the five 40-foot (12 metres) long containers are hoisted onto pillars, and include energy efficient lighting, rainwater saving facilities, surrounded by a permaculture garden. Warm, inviting, and retro chic, inside this space is unrecognisable as a container. Split into two different levels, the double height open living spaces are understated yet eye-catching. The soy stained polished concrete floor is wonderfully decorated with patterned rugs, while matching concrete planters house indoor plants. 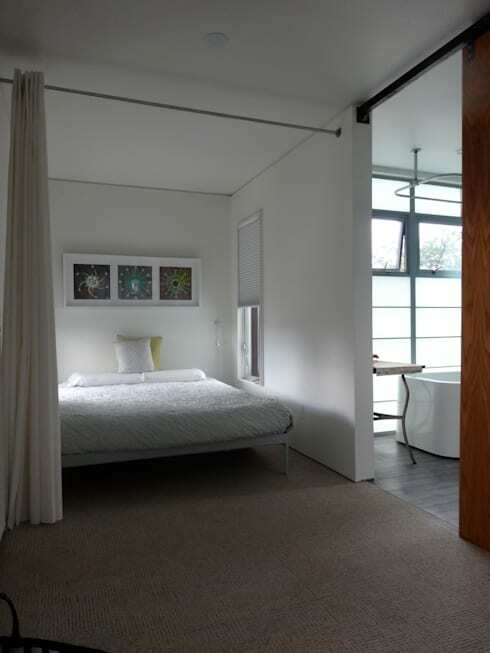 Large glazed sliding doors keep this interior light, bright and airy, additionally providing a sense of connectedness with the exterior garden and natural environment. Changing our perspective, we see the dining room and open plan layout of the main living quarters. Here nothing feels cluttered, but instead oozes a sense of spaciousness, with both practicality and versatility. Frosted warehouse style windows offer privacy to this section of the house, but ensures light passes easily throughout the floor plan. Furniture is bright, eclectic, with a retro feeling, and aesthetic. If you like what you see, and wish to emulate a similar style in your own abode, chat to a professional to get the right advice and some handy design tips. Moving into the kitchen, the attention-grabbing interior scheme is continued. Timber veneer joinery brings warmth to the galley cooking space, and is juxtaposed beautifully against the hard concrete flooring. Offering all necessary amenities, this 21st century kitchen is creative, intriguing, and surprisingly sleek. We particularly enjoy the stainless steel appliances and LED strip lighting, which gives this one-of-a-kind cooking area a touch of individuality and originality. Within the bedroom luxury and comfort reigns supreme. Situated on the second floor of the home, the sleeping quarters boast industrial chic appeal, with an elegance and refinement. A huge king size bed is segregated by a privacy curtain, keeping the bright sunlight out during the early morning hours. 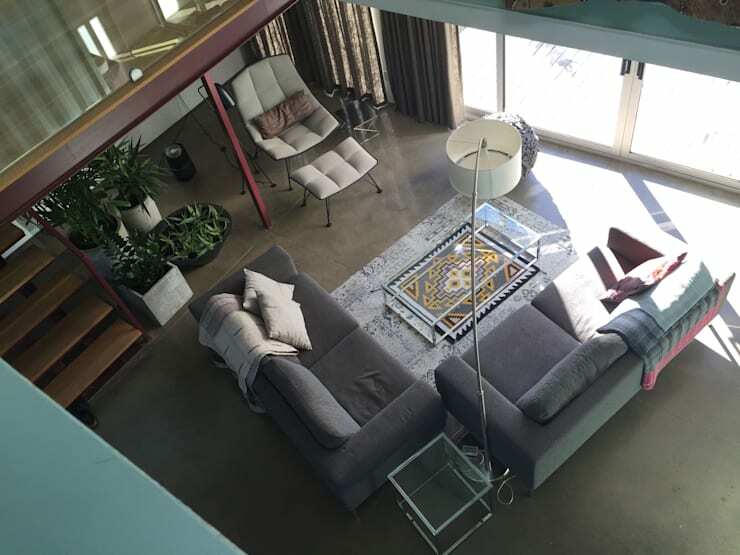 Cosy, comfortable and seamlessly integrated into the rest of the home's floor plan, this room is a striking and stunning addition to the property. Shifting our position and taking a look inside the en suite bathroom, we are stunned to see how much the area looks like an impressive contemporary dwelling. Unrecognisable as a container, the space features timber-look flooring, a huge freestanding tub, rain shower, and gorgeous rustic accessories. 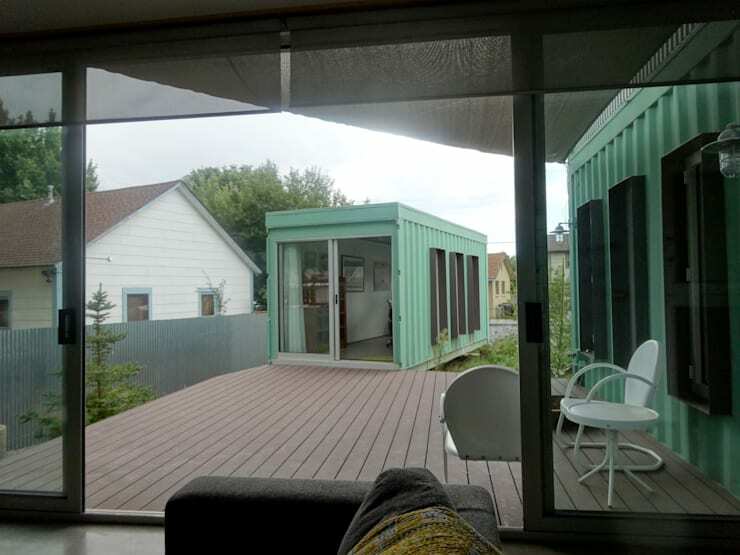 However, the architects ensure that one must still pay homage to its humble shipping container roots, and have included sections of the mint exterior within the room. This keeps continuity throughout the space, evoking a sense of cohesion and design unity. Finally we move outside and take a peek at the additional artist's studio. Housed in a separate 20-foot long container, this area is perfect as an office or separate guest quarters. Replete with a matching mint green fascia, the structure is flanked by expansive decking, which ensures this home is well-suited to the avid entertainer. Would you like to reside in a shipping container home? Let us know what you think of this unique residential option in the comments below!